The Senate may be the place for some former first ladies, but President Bush on Thursday categorically ruled out a run for office by his wife, Laura Bush. "She's not interested in running for office. She's interested in literacy," Mr. Bush said during an appearance at JK Moving & Storage in Virginia. The topic came up as the president took questions from his audience after a speech on the economy. A woman asked if Mrs. Bush would ever run for Senate from the first couple's home state of Texas, and Bush responded "never" — twice. He also declined the woman's plea that she at least ask Mrs. Bush if she might be willing. "She's a great lady," the president said. "She's not interested in running for office." Mrs. Bush's popularity well exceeds her husband's, leading some to speculate that she might follow in the footsteps of her predecessor as first lady, now-Sen. Hillary Rodham Clinton, D-N.Y., and seek elected office. But, as the president dryly pointed out, his intensely private wife has never shown any interest in running for office. "I'm pretty certain, when I married her she didn't like politics or politicians," Mr. Bush said. With an influence-peddling scandal swirling around Washington, Mr. Bush also said he expects elected officials to comply with the law and be open to scrutiny. "In Washington, D.C., there needs to be high standards for the conduct of public officials," he said after a man asked him about tax fraud. Several lawmakers are being investigated for their ties to lobbyist Jack Abramoff, who has admitted to conspiring to defraud his Indian tribe clients, which he sometimes directed to contribute to elected officials. 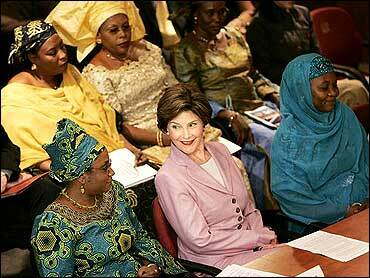 Mr. Bush's re-election campaign has given to charity $6,000 donated by Abramoff, his wife and a tribe he represented. The well-connected lobbyist raised more than $100,000 for the Bush-Cheney campaign, earning him the honorary title of "pioneer," but the campaign is keeping the rest of the money.